There's a hard frost this morning. As the wind blows through the leaves, I can actually hear them clinking against each other. Soon, when the sun comes up and warms them, many will loose their grip and fall to the ground in a rain of gold and orange and red and brown. Cold morning. 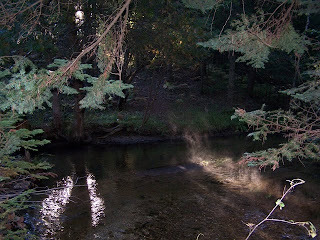 The steam is rising off the creek, creating ghost-like wisps through the cedars. I wonder about the seemingly substantial, the things in our lives that feel so solid. And then, just like the steam on the creek, the images of something once very real are gone in an instant with something as minor as the shift of the sun one degree. And I am left wondering if I imagined it. I suppose it does not matter if I imagined something as fleeting as the steam rising off the creek or my entire past. The memories are still rich and they sustain me. At the time, each experience is wonderful, or painful or peaceful or even magical in that one moment when it is present. And then, in the blink of an eye, it becomes a memory, something in the past to hold on to. Our memories are ultimately all we are, I suppose. Something so simple, so sweet, so painful, or so inviting is really nothing more than a fleeting moment. But in that moment it also becomes a memory we will hold on to forever. And yet, when I choose to be still, to put all the plans and plots and good intentions on the back burner to simmer, I’m present enough to really experience the things that will create lasting memories. I don’t have to work for them. I don’t have to create rituals to make them happen. They are just there for me. And as my bank of memories grows, my present becomes more luscious. The past and the present become woven. The future? Well, I’ll just wait for it to become the present and I’ll see what memories unfold from that.